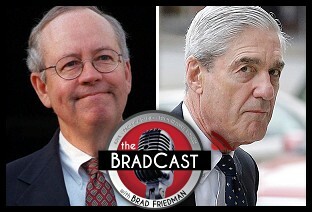 " Why GOP Sees Trump/Russia as Whitewater More Than Watergate: 'BradCast' 8/14/2018	"
« PREVIOUS STORY "'Green News Report' - August 14, 2018"
"Why GOP Sees Trump/Russia as Whitewater More Than Watergate: 'BradCast' 8/14/2018"
There are enough criminal similarities to consider them equals. Then (FEDERAL GRAND JURY INDICTS 7 NIXON AIDES ON CHARGES OF CONSPIRACY ON WATERGATE). Now (Dept. of Justice Conspiracy Theories - 4). One difference between Watergate and Trumpgate is that the Russian mob is involved in Trumpgate (Here’s how the Russian mob used cash from a multi-billion dollar gas scam to get their hooks into Trump).